Halftone brought to you by our own personal halftime show. Stay tuned. There is no reason to sacrifice style for function. 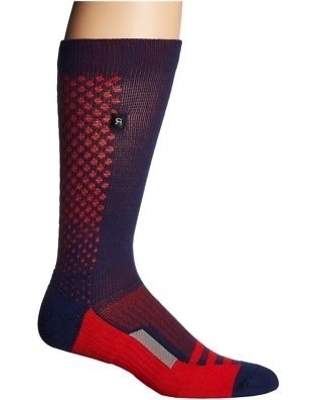 Our Active Performance socks come with uncompromising technical features and considered design. These socks will keep up with you no matter how active your life is. We call this style performance. • Non-Binding Rib Welt: Fancy name, simple concept, the welt keeps the socks from quitting on you. • Moisture-wicking cotton: A hollow yarn core provides the highest moisture-wicking properties and dries extremely fast. • Compression Arch Support: Extra support keeps the sock in the perfect place while giving your arch needed protection. • Strength Lock Seams: Strong low profile seams to eliminate irritation and strengthen durability. • Reinforced Meshing: Extra strength where you need it most. • Padded Foot Bed: Thicker padding underneath the heel, toe, and around the back of the ankle provides reinforcement at critical areas of impact. • Breathable Ventilation: Specialized knit technology keeps air flowing for breathability and quick-drying. No sweaty feet allowed.